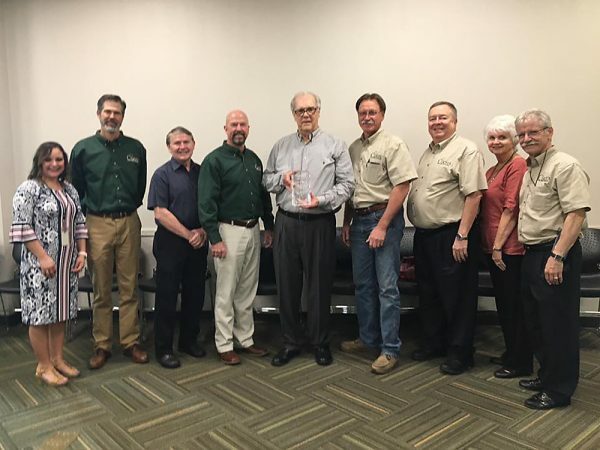 The Cuero Development Corporation held a celebration on Tuesday, January 22, 2019, to recognize retiring president Charles W. Papacek for his 20 years of dedicated service to the community as a member of the CDC Board of Directors. The celebration, 2:00-5:00 PM at the Cuero Public Library, was open to the public and was well-attended by current and past Cuero community leaders, citizens, friends, and family who gathered to honor Mr. Papacek. CDC Executive Director Patrick J. Kennedy and Cuero Mayor Sara Post Meyer were among those who spoke to express their appreciation for Mr. Papacek’s many years of service before he was presented with an honorary crystal plaque by CDC Vice President Dennis Jemelka. Guests enjoyed light refreshments and a special cake for the occasion.